ePublishing Knowledge BaseePublishing Knowledge BaseePublishing Knowledge Base AdvertisingHow do I find out whether my ads are loading properly from Google DoubleClick for Publishers (DFP)? If ads from DoubleClick for Publishers are not appearing where you believe they should be, it's easy to confirm whether those ads are set up properly. To check your pages for common loading errors, follow the below steps. Go to yourdomainname-stage.epublishing.com/?googfc. The following yellow boxes will appear over your website. Zoom: Go to yourdomainname-stage.epublishing.com/?googfc. The following yellow boxes will appear over your website. Those yellow boxes indicate that the website is loading those ads properly. If you don't see a yellow box, then that ad isn't loading. Please contact your Solutions Manager if you have questions or if they are not working as expected. Advanced: At the bottom of the page, the following will appear with additional options to troubleshoot your ads. 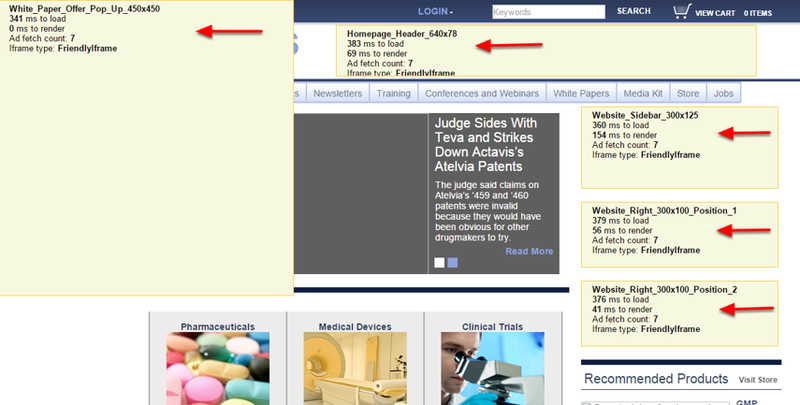 Zoom: Advanced: At the bottom of the page, the following will appear with additional options to troubleshoot your ads. Prev: My Stage Admin tools or website are down. Should I submit an emergency support desk ticket? Next: How do I create interstitial ads on Google Doubleclick for Publishers?